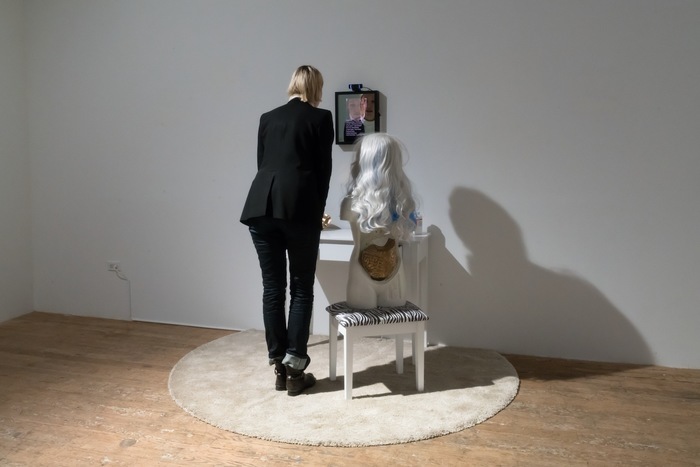 I recently met with septuagenarian artist Lynn Hershman Leeson just after the opening of her latest solo show, Remote Controls, at Bridget Donahue Gallery. 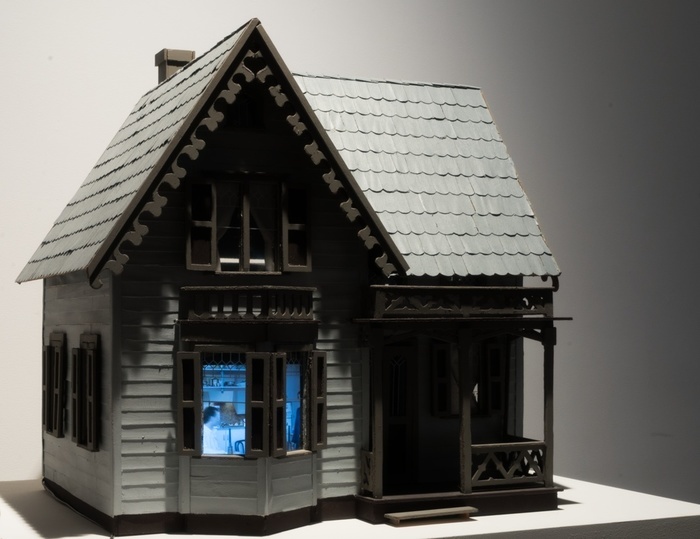 Her first solo with the gallery in 2015 sparked something of a rediscovery of her groundbreaking work, even though she has spent her decades-long career pioneering in the realm of technology in visual art. 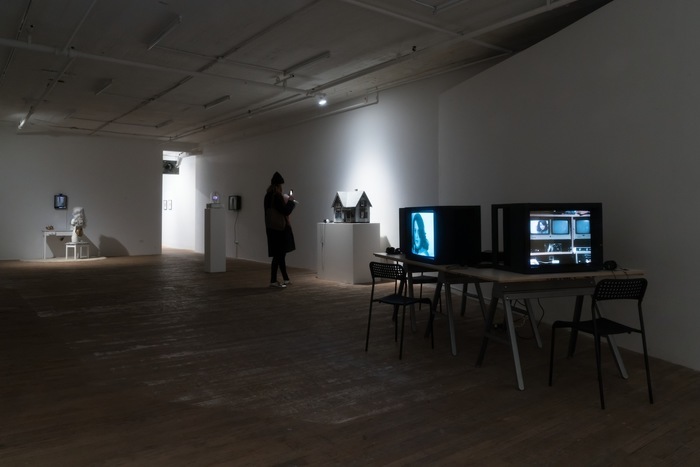 In 2016, a comprehensive retrospective entitled Civic Radar at ZKM in Karlsruhe, Germany, charted her career from its early performative days in the 70s to her latest work addressing complex genetics research and technology. With a portion of the ZKM retrospective coming to the U.S. this month, at the Yerba Buena Center for the Arts in San Francisco, Donahue and Hershman Leeson got the idea to put together a show of firsts—works that had mostly not been shown in New York, yet were the first of their kind to utilize different emerging technologies like the interactive laser disc, the touchscreen, and even video that reacts in real time to stock market data. 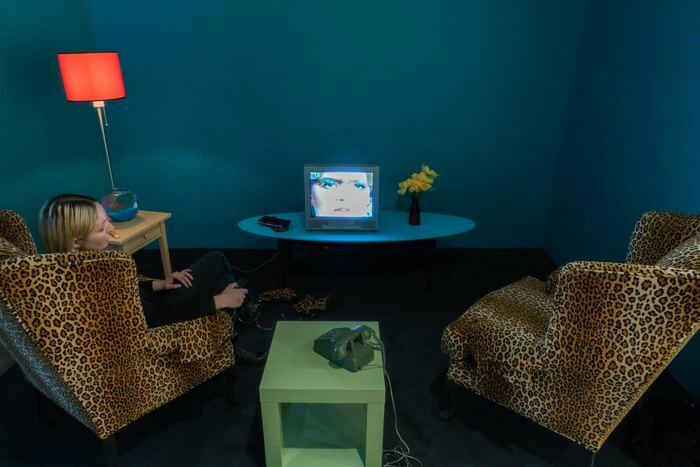 The work in Remote Controls ranges from pencil drawings on paper to complex facial recognition technology, a testament to how vast and curiosity-driven Hershman Leeson’s career has been. During a gallery walk-through, Hershman Leeson carefully explains how she came upon the diverse technological modes she has worked with. More often than not she was ahead of the curve, and yet her name is not synonymous with the innovations she helped to forge. This never stopped her from continuing to try new things, however, and she always embedded an unapologetically feminist agenda within them: from using male pseudonyms to write about her work when no one else would to her investigation of the abuse of women’s images through new media. 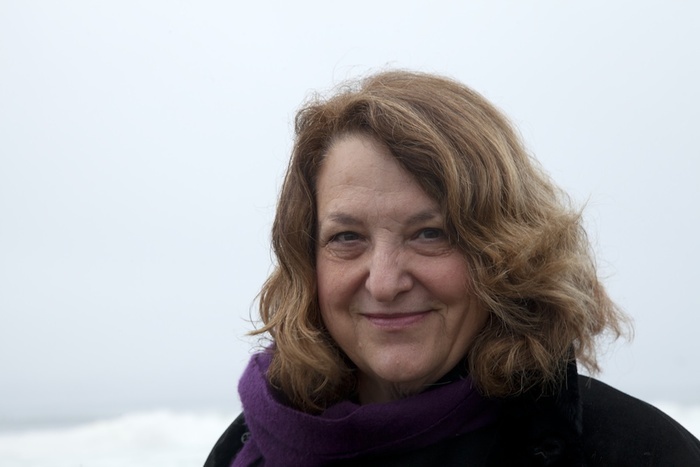 Lynn Hershman Leeson: See, she has all these disposable body parts. On the vanity, instead of make-up there are body parts and the chemicals you use for DNA modification. If you stand in front of it, it takes your picture and analyzes you. Try it! LHL: How old does it say you are? 34. OM: Overshot by a few years, but that’s okay. Let’s see what else it says. Gender: Female; Mood: Surprised; Lips: Parted; Eyes: Open—the rest is true, I guess. LHL: What I like about it is that it’s kind of flawed in its accuracy, but it’s the program they use to analyze the overall mood of crowds. It’s based on a facial recognition system—databases that interpret where your eyes are, or where your mouth is, what makes you female or male. OM: It’s strange too, because you’re seeing your “real self” in the mirror, along with the avatar you on screen, with all of this information that doesn’t necessarily line up. Is it generally pretty accurate? LHL: No! It’s moderately accurate, but not quite. OM: Well, that’s unnerving. Shall we sit in Lorna? OM: The technology used here is similar to a DVD, correct? LHL: Now it is, yes, but at the time, nobody knew what it was, or how to use it. 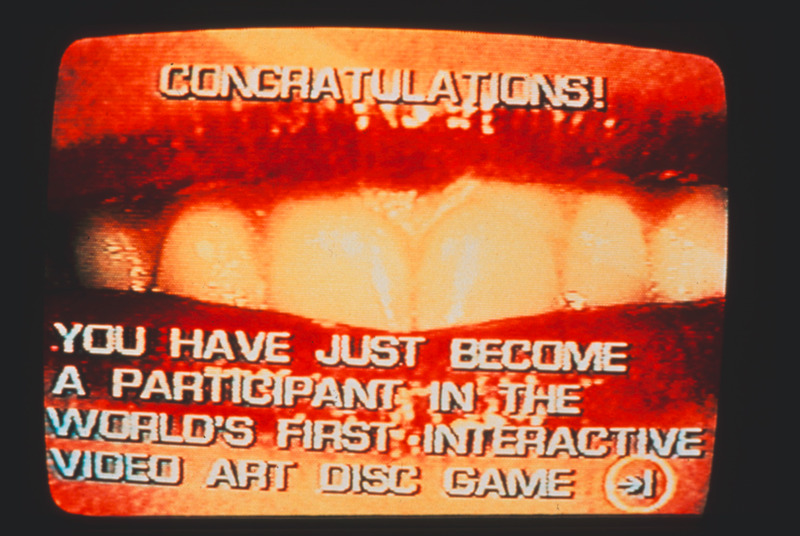 It’s the first interactive laser disc that anyone ever did. I started in ’78 and finished in ’84. In it, you are able to skip around, view multiple narratives, hear multiple soundtracks. Lorna was a woman that was stuck inside, and you make choices for her; you can make her move to Los Angeles, commit suicide, listen to her therapist. OM: Going back to the beginning of your career: the project that turned out to be your master’s thesis in San Francisco was a series of reviews done by invented art critics. What was the impetus for you to start writing under these invented personas? LHL: I think I started writing about art just to learn and begin to develop a voice. Then I couldn’t get an exhibition, or I couldn’t get anyone to write about me, so that caused the invention of these other critics. I was originally writing under my own name, but then I invented these other names so that I could have more freedom, and so people wouldn’t get mad at me. OM: That’s a very invested project, to be keeping up with three different careers on top of your own! How did you end up capping that off as a project—did you present the writings all together? LHL: No. One [critic] wrote for Studio International, one wrote for Flash Art, and one wrote for a throwaway newspaper that you got on your doorstep. I used the reviews about myself (because they would fight about me—somebody liked my work, somebody didn’t) and that’s how I got my first shows. OM: At a time when there wasn’t a lot of opportunity for women artists, you created the dialogue you wanted to exist around your work. LHL: Yes. In those days women didn’t show their work, much less get reviewed, so by taking the reviews to galleries, they became interested in me. OM: Was there any backlash after it came out that you had been behind these three different invented critics? LHL: Nobody knew! It was a thesis that went into the library, and that was it! It’s all collected, and I think it will go into the [Yerba Buena] retrospective, but no one knew at the time. OM: From there, you began working with technology, using sound and mixed media in sculptural, body-like forms. Tell me about the show that was taken down at the Berkley Art Museum. OM: They actually wouldn’t? That was a rule, not just a tradition? LHL: Yes! So they had to do some shows with women, and I got invited to do a drawing show. And to me, sound was like a drawing because it extended into space. I had this piece that used sensors and sound; you would walk up to it and it would talk to you. They had not seen anything like that. Ever. And they said it was “media” and the curator closed it down in one day. She didn’t tell me she was closing it down, she just did it! OM: And that is what spawned the Dante Hotel series? LHL: Yes. We did some Xeroxed flyers and put them around. I also did hotel rooms in New York and Las Vegas, and for those I did these 30-second commercial spots. I bought time on television. And then it was just word of mouth. OM: It’s interesting to use the television spots to promote the hotel series, because much like your own work, it was still a “new media” that was far from being considered high art. But before you really dug into new media you were focused more on performance—like the critic personas, but also Roberta Breitmore [1973–79], where you were spending time acting in a performance while also in your “real life.” What was the leap from using yourself as the virtual or performed reality, towards moving into video as virtual reality, like we see here with Lorna? LHL: Roberta would go out into the world and have “real” interactions and adventures, but then somebody gave me access to the local TV station, and I loved working with [video], because it used time and space and color manipulation and narrative. That was at the end of the ’70s, and then I read about the National Gallery of Art putting their collection on a disc, where you could walk through and view the gallery on the disc. I thought that was really interesting, so I contacted the company that did it, and got the idea for Lorna , who instead of going out into the world, was agoraphobic and was stuck in the room. I went into cable access TV all night to finish it. When you’re doing something that’s new, nobody knows the language, so you can’t explain what you’re doing because they don’t understand it. I just had to not let it go. I felt like, this is a really important and interesting thing I want to do, so why not? How can we get it done? Then it’s just hotwiring and hijacking things to get them finished—mainly because I wanted to see what it would look like! Deep Contact  was the first touchscreen. You have to actually touch the screen on the woman’s body. Depending where on her body you touch, it goes into different options of where you can go with her—you can have her follow a Buddhist Zen master, or a demon. OM: The way you’ve scripted the character, there’s a sort of sexualized element to it. LHL: Exactly. A lot of these works are really about abuse of women’s images, so you physically have to touch her body, and where you touch her body creates a different kind of response. OM: And you were crafting all of the different narratives? LHL: Yes, I wrote the narratives, but we also invented the technology of the touchscreen! OM: And for that you were actually developing the coding? Or the physical technology? LHL: Me along with a few people, yes. There’s a piece in Dreamlands [at the Whitney] called Dina, and we did Dina twelve years before [Apple’s] Siri. Dina, I think is better—she’s smarter [chuckles]. And we had people talking to us about her technology who went on to develop Siri. Eventually my programmer stopped talking to them because we were giving away too much information! And we never patented these things. OM: Both Lorna and Deep Contact deal with women’s lack of agency in culture and society, as well as in their virtual forms—the “abuse of women’s images,” as you said. How did you insert this feminist platform into the technological space, which wasn’t exactly free and open to women to begin with? LHL: It wasn’t free and open, but I wasn’t used to anything being free and open! You know, you just do it. And women really were the basis of all our technology: Ada Lovelace invented the computer language; Mary Shelley invented artificial intelligence; Hedy Lamarr invented the spectrum technology used in cell phones. Women really had a natural inclination to do these non-linear things that had technology. Lorna became mildly successful because the people who could understand it were really into it. So I wanted to do something else, not with a remote where you were distanced from the work, but with a touchscreen itself. It’s trial and error. I’ve worked with the same team since then. And I live in the Bay Area, where technology is in the air, so you can always find people who can lead you to new ways of figuring something out. OM: We have become so immersed in our virtual identities—how do you feel about looking back on the work now, knowing that it’s become so pertinent to the way we live our everyday lives? Did you have any inclination that we’d all be living via smartphone versions of ourselves? LHL: No, no… I keep saying that I needed the millennials to be born because they really get this work—it’s their language. I can’t anticipate the future, but as an artist, you sort of have to do the things that come to you, and culture will slowly catch up. Culture has now caught up in a way that, to me, seems obvious. Because the ideas were present in the days that I created the works, but they weren’t disseminated as widely as they are now. It’s like an amoeba: it puts a foot out and the rest has to follow. Although it’s never as fast as you think. OM: In Civic Radar, the monograph that coincides with your 2016 retrospective at ZKM, you say that interactive technology “is the antithesis of communication as we have known it.” What exactly do you mean by that? LHL: Communication had historically been one omnipresent voice—television or some other authoritarian voice—whereas now anyone can publish and get their message out. I think social media has a great ability to change reality. Look at the Arab Spring. We just have to learn as a global culture how to mobilize it in order to overcome oppression and freely communicate. I saw interactive media as a vital force for politics, in particular for third world countries. Using it to avert oppression is a really potent form. OM: I’m also curious about how you’ve moved from this idea of technological surveillance and voyeurism, into more recent work that deals with DNA, facial recognition, and the ethics around that technology. LHL: I had finished the films !Women Art Revolution  and Strange Culture , and I thought those were really important films that had set clear a history that had not been noticed, and corrected the censorship and eradication of ideas and artists. I thought what can I do now that could be as important?, and that’s when I started to learn about what’s happening with genetics. It seemed amazing to me that this never came up in the presidential election. Between genetic manipulation, loss of species identity, and climate pollution—these are the key issues for the globe. OM: What I find interesting is your optimism for technology. It seems that it’s a very scary line to walk, between the good and the harm that can come from things like AI, social media, and genetics. How do you envision that technology being used for good? LHL: Technology is always neutral. It’s what we as human beings bring to it that determines whether it’s going to be a weapon or whether it’s going to mobilize unity and sustainability, so I really have hope for the future. I believe that young people are interested in sustainability and existence, and will find ways to use the technology that’s been invented to create a planet that we can live in. I can only hope. OM: Any weapon is a tool until it’s weaponized, and we are definitely coming upon that moment where we have so much access that it’s going to come down to not just how the powers that be use technology, but how we as individuals utilize it. LHL: The most vital technology is being invented by young people all over the world—not old white men. They should have the force to use it in a way to defeat the old racist attitudes. Remote Controls is on view at Bridget Donahue Gallery through March 12th, 2017. Civic Radar—originally curated by ZKM, Karlsruhe, Germany—will open at Yerba Buena Center for the Arts on February 10, 2017. Olivia Murphy is a writer and editor based in New York, covering arts and culture. Her work has appeared in various publications both in print and online, including L'Officiel Magazine, Freunde Von Freunden, Whitehot, Riot of Perfume, doingbird, and Whitewall Magazine.